This entry was posted on December 27, 2012 by Jessica Anderson. Our highest achievement - the ARA Large Retailer of the Year. Quarter 1: At the first of the year, we launched our Issaquah Trophy and Trophies2Go videos. If you haven’t done so already, check them out on Youtube/AwardsGuru’s channel . They were a blast to make, are fun to watch, and are great snapshots of our companies! 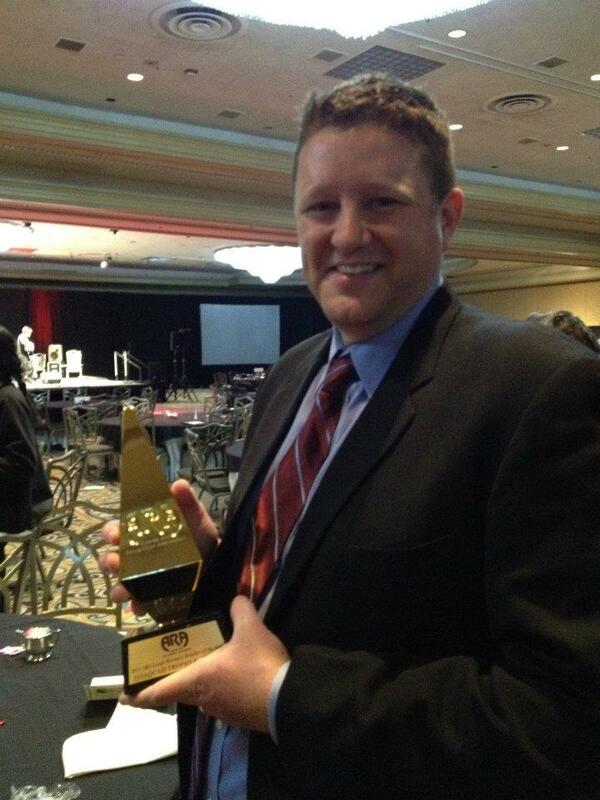 In late January, Jeff, Tom and I attended the Awards and Recognition Association (ARA) Trade Show in Las Vegas. The highlight of the show was when Issaquah Trophy & Awards, our local brand, won the Awards Industry’s highest honor, the' ARA Large Retailer of the Year'. What a thrill it was for our company to win this prestigious award! To end out the quarter, our Q1 ‘Awards for a Cause’ was Relay for Life for the American Cancer Society. Thank you customers for supporting such a worthwhile charity! Star101.5 Weiner Dog Races - check out the awesome trophy! Quarter 2: In April, our CEO Jeff Anderson won the Issaquah Chamber of Commerce’s Business Person of the Year. 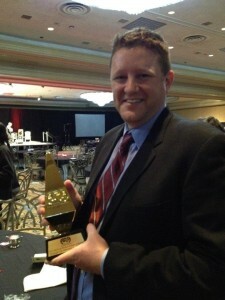 Again, Jeff was humbled and excited to be honored with this award by our community! The Social Media Madness competition was our focus in May. While we didn’t make it to the second round of the contest, we ended in 6th place in our division, and more importantly, launched our Trophies2Go Facebook Page, Issaquah Trophy Facebook page, and our weekly blog posts. In June, we achieved a huge milestone; our 100,00th order! The winner of this distinction went to Dickenson Elementary, in Redmond, WA. Our 2nd Quarter ‘Awards for a Cause’ was SAMBICA, a local Christian Summer Camp. 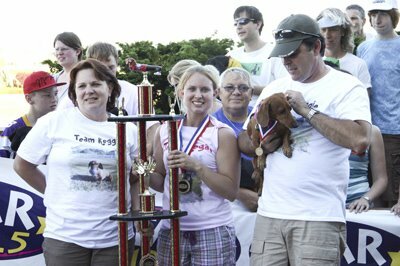 July brought the STAR 101.5 Weiner Dog Races at Emerald Downs, where we sponsor the giant weiner dog trophies. We love this event, as the dogs are hilarious! 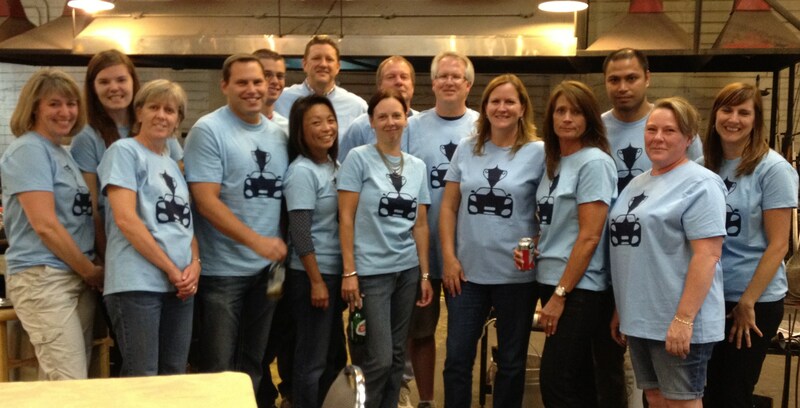 Check out our awesome t-shirts designed by Laurie for our staff party! Quarter 3: The beginning of September brought our glass blowing Staff Party, complete with Trophies2Go t-shirt contest. We had a great time playing games, creating glass art, eating BBQ, and having fun with each other! Our 3rd quarter ‘Awards for a Cause’ charity was the Susan G Komen 3-Day Walk. Not only did we raise money for the organization, but Janice and I also volunteered at the Seattle closing of this emotional and inspirational event. September also brought Issaquah Trophy’s participation in ‘Splash Mob – The Ultimate Salmon Quest’, a Salmon Days event. Brent Naylor won a $100 gift certificate to Issaquah Trophy for visiting our showroom during Splash Mob. Sammy the Salmon visited our showroom one afternoon, playing games and taking pictures with kids from the community. Quarter 4: This fall we unveiled our newest exclusive product…The Honey Badger Trophy! This little trophy doesn’t give a darn, he’s nasty and crazy! December brought our Holiday Staff party, complete with chili cookoff and gift exchange. Anne was the big winner of the cook off, with an engraved ladle as her prize. At the party, Laurie was awarded Jeff’s “President’s Award” for being an unsung hero in the company. We also awarded our 2012 Vendor of the Year (JDS Industries), Customer of the Year (Yvette Smith with T-Mobile) and Product of the Year (Monster trophies from Continental Awards). To recap the year, it’s been a busy one for all of us here at Trophies2Go. Thank you doesn’t seem like enough to acknowledge all of the effort, teamwork, and hard work our staff goes through every day for our customers and our company. Here’s to our Trophies2Go Team: Anne, Chris, Edzel, Janice, Jeremy, Julie, Laurie, Margene, Mika, Mike, Paul, and Tom. You guys are the best, and we wouldn’t be where we are today if it wasn’t for your dedication, commitment and willingness to give your all every day! Let’s put 2012 to bed and bring on a happy, healthy and prosperous 2013!